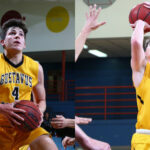 The Minnesota Intercollegiate Athletic Conference announced its men’s basketball postseason awards Tuesday and two Gustavus student-athletes received recognition. Riley Sharbono (Sr., Marshall, Minn.) earned All-Conference Honorable Mention while Nolan Malo (Fy., Owatonna, Minn.) received All First-Year honors. 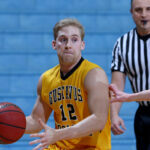 The Gustavus men's basketball team suffered a MIAC quarterfinal loss to Bethel Tuesday night 93-67. The loss will conclude the season for the Gusties who posted an 11-15 overall record. 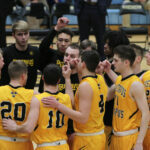 The Gustavus men's basketball team will travel to Bethel on Tuesday night for an 8 p.m. MIAC Quarterfinal contest with the Royals. The Gusties enter the contest 11-14 overall and 8-12 in the MIAC while the Royals are 18-7 overall and 15-5 in the league. 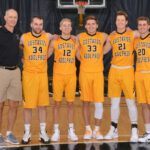 The Gustavus men's basketball team did its part by defeated Concordia 81-68 on Saturday afternoon and got some help from Bethel to secure the sixth and final spot in the MIAC playoffs. 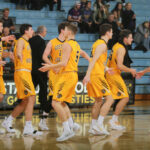 With the win the Gusties improve to 11-14 overall and 8-12 in the MIAC. 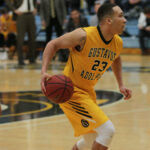 The Gustavus men's basketball team played host to Bethel for Senior Night Wednesday and lost 84-81. With the loss the Gusties fall to 10-14 overall and 7-12 in league play. 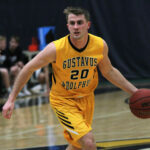 The Gustavus men's basketball team will play host to Bethel at 7 p.m. on Wednesday night for a key MIAC matchup. 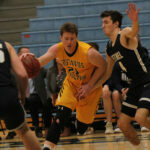 The Gustavus men's basketball team traveled to Augsburg on Wednesday night and fell by a score of 94-88. 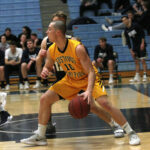 The Gustavus men's basketball team will travel to Minneapolis on Wednesday night for a 7 p.m. contest with Augsburg.